I’m becoming concerned that Theater Hopper may be getting a little too big for it’s britches. I checked my server statistics for April, and we’re pressing up against 12GB in bandwith transfer. My account is only alotted 15GB. A lot of the drain is due to the information that appears on the left and right hand side of the comic. Every time a page is called, it’s reloading that information. And while the images there are less than 1k in size, after 300,000 reloads, it all adds up. I’m beginning to think the site will need to undergo a redesign soon. I’m reluctant to do it because I’ve yet to re-enter all of the blogs from when we converted to PHP about a month ago. If anyone out there is proficient in web design or perhaps has some database knowledge, please contact me. If you have any tips or tricks to help me reduce bandwidth consumption. I am eager to hear those as well. I just wanted to point out that we’ve fallen off the Top Ten at Top Web Comics. So this is just a little reminder to get everyone in gear and VOTE EVERY DAY!!! The other bit of site news is that I am now selling advertising space (click on the link for more information). So if you have a site you would like to promote, please keep Theater Hopper in mind as an advertising option. More spots will probably become available on the left and right hand sides of the comic in the near future. So, look out for that, too. I know there was some talk in the past about me redesigning the site, but that looks less likely now. Every layout I came up with just looked weird. Especially since I didn’t want to lose the curtains. So what I’ll probably end up doing is ditching the links on the sides and replace those with advertising. Any specialty site news like merchandise or reviews will be placed directly below the comic but before the blog in a handy rotating banner set up. I’ll probably expand the width of the blog space as well so you won’t have to scroll so far to read it. These are just minor touch-ups. But I thought you would like to be aware of them. 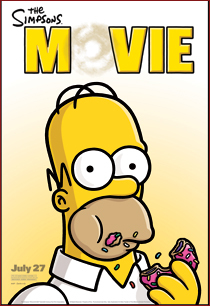 You’d have to be living under a rock not to be aware of The Simpsons Movie coming out on June 27, but have you guys checked out their recently revamped web site? You should really check it out. There are a bunch of new interactive elements and games, wallpaper, buddy icons, the whole digital marketing gumbo. Even ring tones! The thing I like the most is The Simpsons avatar creator. So if you ever wondered what you would look like if you lived in Springfiled, now you can make a version of yourself Simpsons-style. Here’s another bit of Simpsons goodness you’ll only get here: Check out the recently redesigned Simpsons Online Store and enter the word “HOMER” at checkout to get 10% off your total purchase. Don’t say I never did anything for you! I think I’m going to buy the Season 8 DVDs. I’m falling behind in my collection. This movie has been in production for so long, it’s like I can’t believe it’s coming out. Almost like I don’t want to get my hopes up until it’s ACTUALLY in theaters. But there’s a good chance once it’s out there that I’ll be seeing it, oh, ABOUT A BILLION TIMES!!! Hey! Three comics in one week! It’s been a while since something like that happened! Maybe there was something good to come out of my computer problems after all! About that – my computer problems – I’m still having them. In fact, be sure to hit the little “BACK” link and check out the comic I posted Thursday and read the blog post that describes them. Originally it was my plan to post a special Fourth of July comic using my day off to accomplish the task, but I posted it late because of… well, computer problems. 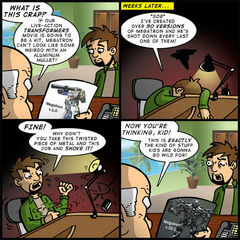 Today’s comic was based around my reaction to the redesigned robots of Transfomers when my opinion of them was less favorable. I’ve since eased back from my position, mostly because I’ve bought into the hype. But you can’t deny that when those first images of the movie version of Megatron started showing up on the internet, people had a hard time making heads or tails of it. I’m not of the opinion that Megatron needs to retain the aluminum mullet look from the original cartoon show. There have been probably a half-dozen iterations of the Transformers franchise in cartoon shows over the years and Megatron has been everything from a tank to a Tyrannasaurus Rex. Altering the look of the Transformers to suit their environment isn’t the problem. In fact, that’s the whole point – they’re robots in disguise! But take a look at this guy and tell me he doesn’t look like his designer had a conniption fit while illustrating him. Shards of twisted metal? What the hell is he? As I said before, I’ve softened on my opinion of the designs. This is mostly due to the overwhelming positive response given to my by friends who have already seen the movie. They’re convinced that Transformers does something no Hollywood picture has done in a while – and that’s show us something new that astonishes us. I’m down for that and I’m really looking forward to seeing the movie tonight. I’ve even got Cami talked into going! She wants to see what all the noise is about. As much as I’m psyched for Transformers, I’m afraid I’m falling behind on other movies I want to see equally as bad. A small indie theater in town just picked up the Irish musical Once, which I’ve been dying to see since I saw a trailer for it on IFC a month ago. Of course, there is still Sicko and Ratatouille to contend with. And these are all movies Cami wants to see, too. So it’s not like I can sneak out of the house under the guise of not wanting to waste her time. I feel like I’m reaching for the low-hanging fruit by going to see Transformers first for the simple fact that it’s the movie that everyone is talking about. It’s like there’s this weird peer pressure to see it. If not peer pressure, at least some kind of need to prove we’re still tied to pop culture in some way. I feel guilty that we’re giving it priority when a movie like Once probably won’t be around for another two weeks. But what can I say except “the squeaky wheel gets the grease?” Or, I suppose in this case, the movie with the most explosions and makes the most noise gets the grease? At any rate, that’s pretty much all I’ve got. I should be back on Monday with a review of Transformers. See you then!